Srinagar, February 16: Excellent coordination between various security agencies has led to success for the security forces in Kashmir. 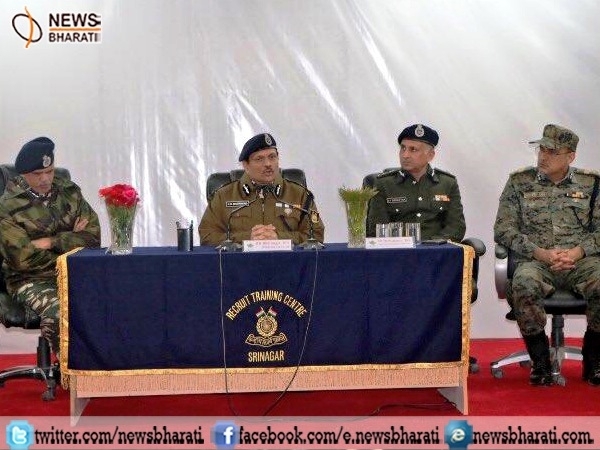 This was said by Director General Central Reserve Police Force (CRPF), Rajeev Rai Bhatnagar on Thursday while addressing a press conference in Srinagar. The DG CRPF said that excellent coordination between various security agencies is the reason behind the success of the security forces and in future such success will be achieved as well. He further said that the operations against the terrorists will continue like last year where major commanders of these terror outfits were eliminated. Rajeev Rai Bhatnagar said, "Security forces achieved major successes last year and killed top commanders of terrorist outfits," while adding that the future challenges will also be dealt with excellent coordination and situation will be kept under control. "We are alert and will remain so to foil any militant designs", he added. The DG also stated that process of out of turn promotion of the sentry has been initiated. "The process for the out of turn promotion for the sentry has been started. In June last year the sentries negated a similar type of attack in another camp, they will also be provided promotions", he added. DG Bhatnagar said that the para-military force is taking care of the families of those who lay down their lives. "As per our martyrs and their families are considered there is a process in place to take care. It's true the compensation varies in different states but several ways have been created to provide adequate compensation to the families of all martyrs", he added. Lauding the Bharat Ka Veer app, he, in the end, said, "In one such initiate, Bharat Ka Veer, we have started new forum wherein Rs 25 crores have been accumulated and that money will be provided to the families as well. Apart from that the Central Government has its own ‘risk fund' which takes care of families. We not only award them funds but also ensure yearly visits to their families. We have also installed their nameplates in the schools and hold regular functions to inculcate patriotism in the future generation."